So, you’re having a party! And you’ve figured out that many parties need things (tables, chairs, plates, napkins). There are two ways to get said things: 1) buy them 2) rent them. (Number 3, “Borrow them from someone you know who already bought them,” is maybe worth mentioning as well, but that’s a specific scenario we’re not going to cover today.) The question on your mind now is—how do you figure out whether to rent or to buy? And what kind of things are we talking about exactly? Most people have only ever rented apartments and cars before their weddings. But the truth is, lots and lots and lots of weddings involve at least one rental order. (I’m actually having a hard time thinking of a single wedding I’ve done that didn’t have rented items.) 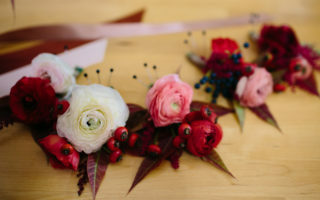 If you’re hiring full service caterers, there’s a good chance they’ll be renting things for your wedding, and if you’re self-catering or using food-service only caterers, there’s a good chance you may not have thought about it yet, but you’ll end up wanting to place a rental order at some point in the planning process. So let’s say that you’re one of the aforementioned couples who will have to rent something for your wedding. Most of the weddings we execute involve at least the following: tables, tablecloths (called drapes in the industry), napkins, chairs, plates (often dinner, salad, and cake), forks, knives, and glasses (water, wine, beer, rocks as needed). Less universal but still relatively common items might include patio heaters, cocktail tables, table number stands, bread baskets, beverage dispensers and tubs, lounge furniture, and lighting. If you’re in a major metropolitan area, there are lots of rental companies available to you, and some differences between them. You may be surprised to know that the major difference between them for most things isn’t price, but the quality of their items. Most of the rental companies we work with have extremely similar prices on the majority of rental items, but I know from experience that some of them tend to send linens that are too short, or stained, or just generally not as high quality as those of other companies. If you don’t have a caterer, planner, or other pro to ask, it may be worth going by some showrooms to look at the quality of their items in person. Other key differences between rental companies are delivery windows and charges; minimum order amount; if dishes/glasses/silverware need to be returned scraped, rinsed, or washed (all of which are decidedly different amounts of labor); and willingness to work with you without having you setting up a professional account. If you’re handling your rental orders yourself, it’s probably worth calling a few different companies to ask them these questions and get a general quote started. Could you buy these things for the same amount? Sure. My best friend’s thirtieth birthday party was in July, and he insisted on having people drink out of real glasses (…personal quirk), so in the two days beforehand we bought all the glasses at thrift stores for an average of about 50¢ each. They didn’t match, and we had one per person, so we had people write their names on them with a Sharpie. But it was a party in an industrial loft, and they were great. We also didn’t really have time or transportation resources to deal with rental glasses (most rental companies have a minimum order amount for delivery). Cotton and polyester linens almost always cost the same. Cotton is always way, way nicer, so request it if you can (and make sure to request it from your caterer if they’re running your rental order). Always order approximately ten extra plates/forks/knives/napkins. You may have one or two show up chipped, or have a guest drop one, or realize you forgot to include your vendors in the headcount (and they need to eat off of something!). If you’re serving cake, don’t forget about an extra set of plates and forks to serve it on! If you’re not sure exactly how many guests you’re going to have (i.e., if you’re placing your order before the RSVPs are in), put your initial rental order in for the high amount. The vast majority of rental companies will let you change your order with no penalty up to about three days before delivery, which means that if you need to drop two tablecloths, it’s no problem. However, if you need to add two at the last minute? There’s a chance they’ll be entirely out of your color of choice. Generally you’re going to pay a flat delivery and pickup fee, no matter how many items are in the order. Because of this, it’s best if you can only have one rental order, so if you want to rent specialty items, talk to your caterer or venue to see if they’re placing a rental order and you can add onto their existing order. (Note: Most catering companies don’t actually own full sets of dishes/glassware/linens; they’re renting them for every event. See: Storage.) This also makes it easier on the return side. With two orders you have to make sure things get separated appropriately and not sent back to the wrong company. I’d actually argue that anyone who plans on throwing parties larger than dinner-sized on the regular should get used to renting things. I regularly rent tablecloths, folding chairs, and racks of glassware for personal events (birthday parties, baby showers, etc., that I throw for friends and family) because it’s often easier and more resource-efficient to do so than it is to own something I may only use once or twice a year but have to store the rest of the time. Photos by APW Sponsor Emily Takes Photos; centerpiece flowers by APW advertiser belle-flower; rentals from Hartmann Studios. Elizabeth has been planning weddings since 2006, and has done so full time under the Lowe House Events banner since 2011. She considers herself incredibly lucky to get to work on events full time—it just doesn’t get much better than going to a party most weekends because it’s your job.